Plain intercurrency arbitrage between two brokers. Arbitrage at one broker involving more than two currency pairs. Interest rate arbitrage with a swap-free broker and a normal broker. Triangular (or more complex) swap arbitrage at one broker. Despite their similarity, all these methods are quite different and have distinct advantages and disadvantages. Simplicity — easy to understand and to calculate. Lack of asset value risks — once the right opportunity is detected and the trades are executed, you do not depend on currency rates as the combined position is market-neutral with zero exposure. The opportunities are rare — the difference in quotes should be sufficiently big to cover the spread and to provide profit. You need to have enough margin in two trading accounts to execute the deals. You need some technical means of executing both trades simultaneously at two different brokers. It also has to be done two times per one arbitrage operation — for entry and for exit. Execution risk is very high due to the above-mentioned factors. Transaction costs for transferring funds from a “winning” account to a “losing” account can destroy all the profit. Consider the following example: GBP/USD is trading at 1.2918/1.2919, EUR/USD at 1.0908/1.0909, and EUR/GBP at 0.8448/0.8449. You buy EUR/USD at 1.0909 and sell GBP/USD at 1.2918. What you get is the locked position, which equals a EUR/GBP Buy at 0.8448 (EUR/USD Ask divided by GBP/USD Bid). If you simultaneously sell EUR/GBP at 0.8448, you lock 3.2 pips of profit when the rates normalize. While 3.2 pips might sound quite cool, the problem is that you have to deduct 3 pips of spreads for closing these three positions if you want to realize your profit. That leaves you with 0.2 pips profit, which is still quite good considering its “risk-free” nature. What is important to remember here is that you have to use properly calculated position sizes in such triangular arbitrage. In the example above, if you sell 1 lot of GBP/USD, you need to buy 1.1842 lots of EUR/USD and sell 1.1842 lots of EUR/GBP (calculated as GBP/USD Bid divided by EUR/USD Ask). If everything is executed properly, there will be no exposure to currency risks. All money at one broker — no need to transfer cash from the broker where you “win” to the broker where you “lose”, unlike is the case with the previous arbitrage technique. Extremely rare opportunities — brokers are not stupid and check their quotes thoroughly. They also might have clauses in their Terms and Conditions prohibiting such arbitrage methods. Still, you might be able to find ECN brokers that would not mind this strategy. Involves paying spreads for three positions, which is always costly, and means that the opportunities are next to nonexistent. Position sizing calculation is not only difficult but affects the end results as not many brokers let you use precise trade volumes down to a unit. If you are trading on MT4 or MT5, using a cent account is essential to reach the necessary precision. Execution risk, although lower than when you have to use different brokers, is still here. Getting a requote or slippage with a triangular arbitrage trade can be deadly. Triple margin — you will not get reduced margin requirements due to hedged positions because they are hedged indirectly, so you would need to keep quite a lot of money to pull such trades. If you are a savvy trader and are up-to-date with the current central bank interest rates and their effect on Forex trading, you have probably already thought: “Why not buy TRY/JPY at a swap-paying broker and sell it at a swap-free broker?” After all, there is a rather large subset of brokers that offer Islamic accounts and neither charge nor pay overnight interest there. Consider an example: as of May 8, 2017, you can buy 1 lot of TRY/JPY at one broker and get 0.86 pip daily swap (which is about $7.67) and simultaneously sell TRY/JPY at a swap-free broker. Any upward movement of the currency pair will be compensated by the opposite movement of the same size at another broker, so the asset value risk seems mitigated. Your account at the swap-paying broker will be constantly accumulating positive interest rate difference between the Turkish lira and the Japanese yen. Opportunities are very easy to find — there are many currency pairs with high positive swaps and there is abundance of swap-free brokers. No need for any sophisticated execution technology — the swaps arbitrage trades can be found and executed manually. The Bid/Ask spread is the biggest disadvantage of this arbitrage method. First, the spread for currency pairs (exotic ones) that offer such huge swaps are usually very wide. Second, you have to recover both spreads — for your Buy and your Sell — to start earning money. In the example above, if the spread is 40 pips (which can be considered normal for TRY/JPY) at each broker, you will spend 94 days just waiting for the rollover rates difference to compensate the spreads. While currency rate risk seems removed here (same as with the first type of arbitrage), the rate movements can be very strong with the kind of currency pairs involved in this. Keeping enough margin to prevent stop-out might prove difficult. Brokers hate this. Not the normal swap-paying ones but the others — swap-free ones. If they find out that you are arbitraging interest rate using their no-interest accounts, you might get your account blocked or your profit removed. Unfortunately, such brokers are often unregulated and can do almost anything they want with your account. Transaction costs (deposit/withdrawal fees) to keep funds properly distributed between two brokers can be prohibitive. Similarly to the triangular price arbitrage, its swap counterpart can be performed within confines of a single Forex broker. This significantly reduces the execution risks, free margin requirements, and transaction costs. At the same time, unlike it is the case with the price arbitrage, the swap arbitrage is not viewed so adversely by brokers themselves. AUD/JPY: −0.5 AUD for buying, −3.0 AUD for selling. You buy 1 lot of AUD/USD and 0.7423 lots of USD/JPY. You are now exposed to a long position in AUD/JPY with the size of 1 lot. You need to hedge it by selling 1 lot of AUD/JPY. Now, you are in a triangular hedge lock, which should mitigate all the currency value risks. From the swaps perspective, you will be getting $1.85 ($A2.50 × 0.7422) for your AUD/USD Buy and $0.44 ($0.60 × 0.7423) for your USD/JPY Buy per day. You will also be paying $2.23 ($A3.00 × 0.7423) per day for your AUD/JPY Sell. Therefore, your total daily gain from this arbitrage setup is $0.06. While it does not look much, it can be considered risk-free for as long as the swaps do not change. Low execution risk as everything is done within one broker, and the currency rates do not matter much here (except for proper position sizing) while swaps rarely change in a matter of seconds. Brokers do not care much about this sort of arbitrage. Swap arbitrageurs pay good spreads and rarely see realized profit (see Disadvantages below). Long-term passive income in case of a successful setup. No losses due to transfer/deposit/withdrawal fees — everything is executed at one Forex broker. Spreads — you have to recover the value lost to spreads on three trades to get to breakeven. In the above example, the total loss due to the spreads is $25.49 ($10 for AUD/USD, $6.60 for USD/JPY, and $8.89 for AUD/JPY). It would take 425 days just to recover the spread loss! Likely, the swaps would change during the period. Technical difficulties for coding proper opportunity detection and execution tools. An arbitrageur would need to hold enough margin for three (or more) positions as hedged margin reductions do not apply to indirect position locking. Four methods of arbitraging the retail foreign exchange market have been described. As you can see, none of them is completely risk-free while all four seem rather viable. What can be said about all of them is that even if opportunity is found and executed flawlessly, they require significant capital to provide meaningful income. There is little point in arbitraging with a $100 account for some 15% yearly ROI. I, personally, do not use any of these methods in my trading. However, I am quite interested in trying out the triangular swap arbitrage once I find (or create) the right tool and open a trading account at a suitable broker to engage in this sort of market activity. And how about you? What kind of Forex arbitrage do you practice? 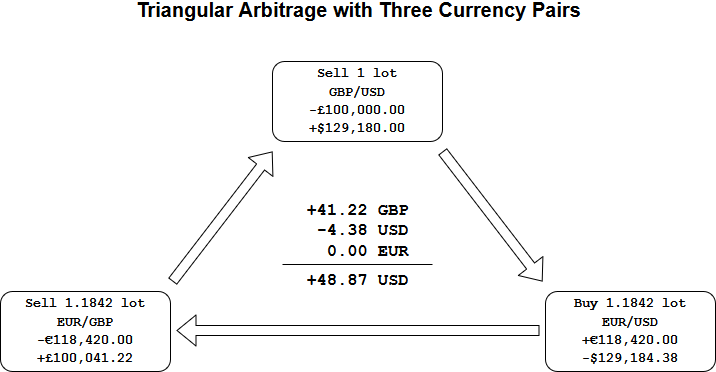 Intercurrency arbitrage between two brokers. Arbitrage with more than two currency pairs at a single broker. Interest rate arbitrage between a swap-free and normal brokers. If you want to tell us more about how you use arbitrage opportunities in Forex, please feel free to reply using the commentary form below. I enjoyed reading your blog post. I’m familiar with four methods of arbitraging you’re describing, but I like the way you set it up with pros and cons because it makes it easier to consider and understand the topic. This trading style suits me because I am a long-term trader. I have no aversion against day-trading etc. it’s just not for me. In the middle of your posts where you write about arbitrage between a swap-free and a regular broker you mentioned most swap-free brokers are unregulated: Do you have any references for regulated trusted swap-free UK brokers? I ask because I guess other readers might have this question as well after reading your blog post. From the FCA-regulated brokers, eToro, HYCM, Citypoint Trading, FxPro seem to be offering swap-free accounts. However, these companies require some documents confirming that you need a Shariah-compliant account to trade Forex. Thank you. I’ll look more into it. Knew some of them but Citypoint Trading was new to me.